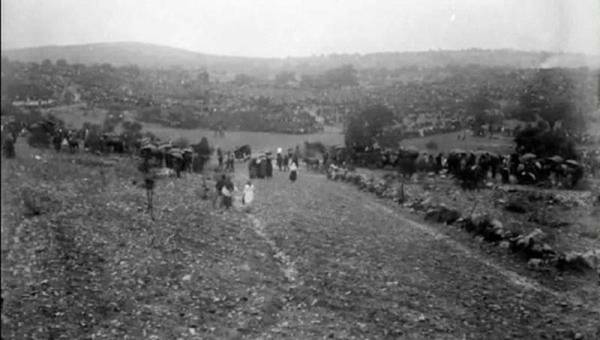 The Cova da Iria was where the Blessed Virgin Mary appeared to several young shepherds named Lucia, Francisco and Jacinta who'd taken their sheep there to pasture. Perhaps not a lot more is thought about this place in Portugal, but there is more to be known and thought about. It was a place chosen from On High for heavenly visitations. To give this some apparitional context, let us consider the encounters from heaven at Guadalupe, Lourdes, and then at Fatima. One may ask whether there is anything about the place names — or what's associated with them — of a spiritual nature. What is more significant at Tepeyac is that the Indians had a temple on this hill to a pagan mother goddess called Tonantzin, (Aztec: To [our] + nantli [mother] + tzin [a reverential suffix] ), making it easier for the Indians to make the transition to Mary being a maternal being, as they already recognized that meaning there. The Indian could take from it, that the true Mother of God was replacing this false mother goddess. In her image placed on the outer garment of Juan Diego, beneath her folded hands, one may see the loose ends of cloth, which signify her maternal condition, the Presence of Jesus in her womb. Mary also expressed her spiritual maternity when she called Juan Diego her son, and herself, his mother. Her maternity therefore is twofold: she's the physical mother of Our Lord and the spiritual mother of Juan Diego. The Indians could also see humbleness in her pose and gestures. As to Lourdes, while it's of interest in the way it was named, there's more of interest in the happenings that took place there. Besides the story of Bernadette, there's another that's worth noting in some detail. In 732 the Saracens, invading territory that's now France, penetrated as far north as Tours on the Loire River. Here Charles Martel defeated them. Francis Trochu, an international historian of note (has books honored by the Academie Francaise), says that the Sararens retreated toward Spain with some holding out in fortresses in Aquitaine, one being the castle of Mirambel upon rock that overhung what is now Lourdes. Trochu also wrote about the grandson of Martel, known in history as Charlemagne. He said a weary Charlemagne, returning from Spain in 778, attacked the garrison at Mirabel and laid siege to the castle. In the fortress was one Mirat who swore by Mahomet that "he would not surrender to any mortal man." The stronghold seemed impregnable, and the siege prolonged. The town, to become Lourdes, was situated in the foothills of the Pyrennes, where the rearguard of Charlemagne's army coming through these mountains, had been ambushed by Basques in Rouncevaux Pass. They killed his nephew Roland, the hero of the French epic, The Song of Roland. According to an account in Trochu's Saint Bernadette Soubirous, an eagle dropped a trout inside the walls of the enemy-held fortress. The bird had seized the fish from a river known as the Gave. Another account, a legendary one, says the trout was enormous and the eagle dropped it at Mirat's feet. Trochu wrote that the “still floundering” fish was sent to the besieger to indicate that they had plenty of food. Trochu says Charlemagne was discouraged and thought of lifting the siege. But, Trochu wrote, Roracius, Bishop of Le Puy and Chaplain of the Frankish army, smelled a ruse--something fishy, if you will. He arranged an audience with Mirat and saw that the Saracens had run out of resources. Mirat stood by his oath. The bishop asked him: "Brave prince, you have sworn never to yield to any mortal man. Could you not with honour make your surrender to an immortal lady? Mary, Queen of Heaven, has her throne at Le Puy, and I am her humble minister there." Freed of his oath, Mirat accepted, and — surprising as it may seem — became a Christian, baptized under the name Lorus. Knighted by Charlemagne, he received command of the fortress. The learned assert, so it's said, that it's from Lorus that the name Lourdes comes. Mirat made a vow he wouldn't to surrender to any mortal man, but when it was put to him whether He'd surrender to a woman, namely, the Blessed Virgin, he yielded and even became a Christian. Here a Muslim converted to the True Faith because of Mary. A sign may be seen in this, and this assumes great importance in the unfolding of happenings in the world. 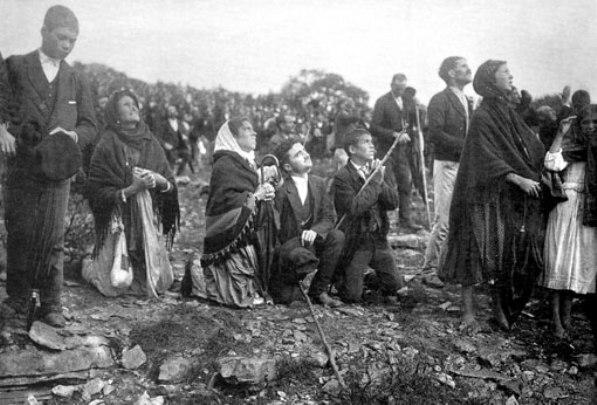 In Portugal, Mary's appearances to the shepherd children, was at a cova near a village called Fatima, a name that became attached to her visitations. She, the mother of the Lamb of God, came to where these young people were tending their sheep. One of the meanings given for the name Fatima, is "one who weans an infant or one who abstains." Abstaining includes making personal sacrifices, part of the message that Mary would bring to the visionaries. After appealing to the seers to offer themselves to God and submit to suffering in reparation for sin, "they began giving their lunch to the sheep and then to poor children. Francisco climbed a tree to pick acorns for them to eat, together with pine cone hearts, roots and blackberries." Among meanings for cova is a cavern, a hole or even a dimple. This cova where Mary appeared is descriptive of a large surface cavity or hollow in the land, located a little northwest of Fatima. Fatima is situated on a limestone massif and in the area are geological formations of sinkholes, caves with stalactites and stalagmites, and karst grottos (Karst is a landscape formed by the dissolution of soluble rock like limestone). The formation of the cova in light of what would in time occur there, and be used for, is God's work through His processes of nature. Local geological study may show something different, but with a knowledge of limestone rock, might it not be possible that the cova is a subsided and sunken area resulting from subterranean dissolution? It seems possible. In the course of time this cova would become a gathering space, like an large amphitheater, for a response in prayer and devotion, regarding what heaven would request. It was called the Cova da Iria. But of the three words, Cova da Iria, the important word is Iria. It's the name of a saint, one special enough for Christ to intervene and tell of her martyred whereabouts. Born in Tomar, Portugal, legend says she would leave her house to attend Mass or pray at the sanctuary of St. Peter. It happened that a young nobleman named Britald saw her on one of these occasions and fell in love with her. He followed her and proposed to court her, but she had given herself to God. Her tutor monk also fancied her, made unwelcome advances, and when she turned him down, he quit teaching her and spread rumors. He gave her a drink to bloat her belly, and said she was pregnant. Britald learning of her supposed infidelity to her virtue of purity, became enraged and hired a soldier to kill her. This Visgothic maiden was martyred in the year 653. 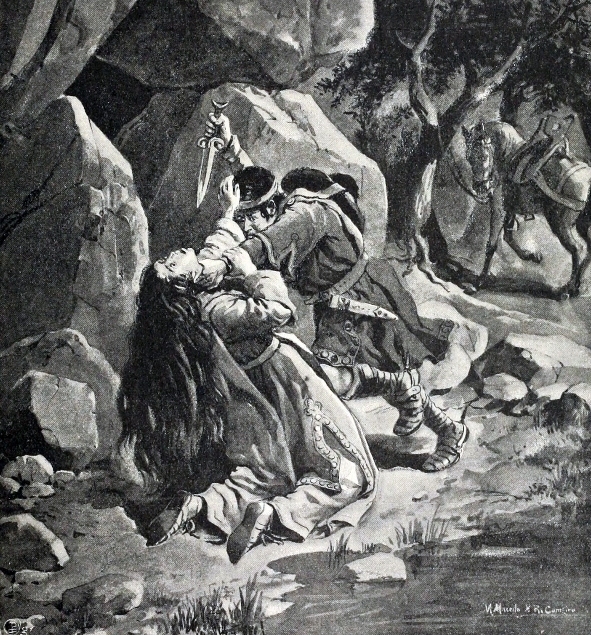 The murder of Irene, a lithography by Manuel Macedo and Alfredo Roque Gameiro, 1904, 13 years prior to the 1917 apparitions of Mary. Her body was thrown into Nabão River, which flows through Tomar, and afterwards into the Zezere, and from that river into the Tagus, also called Tejo. Her martyred body was later recovered incorrupt near the town of Scabalis, situated on the Tejo. It had been washed downstream for some distance. Legend says that Christ revealed to Iria's abbot uncle, the truth about his niece and her body's whereabouts. The monks recovered her body and gave her a proper burial. The name of Scabalis was changed in her honor, and was called Santarem, for Santa Iria, her holiness being recognized. In some way her name also became attached to the Cova. One account says she probably had a hermitage there. Another states her prayers may've "won her the courage there to protect her virtue, even at the cost of her life." And yet another relates that the Cova da Iria was without doubt named in her honor, but martyred at Tomar. Whether at the Cova or Tomar, the Portuguese soil drank of her martyred blood and the Cova remembers her with the name, Cova da Iria. Accounts sometimes differ as to how something comes about in people's recollections of history. Sometimes the more you know, the less you know...that is, know for certain, from differing versions. Geographically, the Cova is near Fatima, and by flight, the distance between Fatima and Tomar has been figured at 13 miles, and by driving, at 24 miles by winding road. The Nabão River runs southward toward Tomar with its course flowing some distance east of Fatima and the Cova. So there's an unknown here and an improbable. It would seem quite unlikely that Iria was martyred at the Cova and then taken a number of miles east, to be thrown in the Nabão. Yet there's a connection to the Cova in some way. Today there's even a school seal that honors her, so this certainly lends credence to her being remembered. But there's more about her name, and consulting an internet source called Behind the Name, it says it's possibly a Portuguese and Galician form of Irene. Of Irene it says it's from the Greek Eirene, which, in turn, derives from a word meaning "peace," and is a name given several saints. Also under Irene, it says Iria is a variant. Nameberry says Iria means "peace," a Portuguese variation of Eirene. Yet another source Everyday Family says Iria's meaning is "rainbow, a play of colors." This is interesting in light of what would occur at the Cova in October 1917. There was a display of different colors. Mary wanted the Rosary to be prayed for peace in the world. 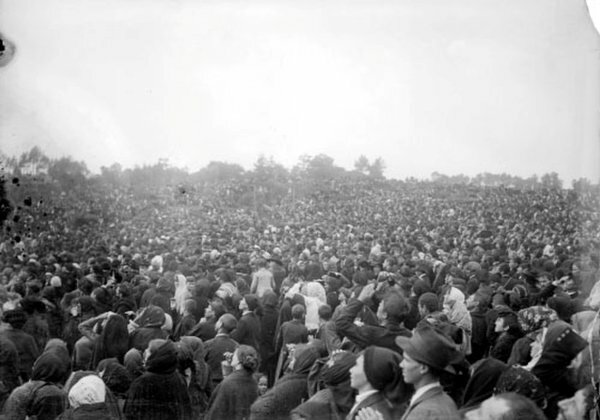 She said in June 1917, "Say the Rosary every day to obtain peace for the world, and the end of the war." In July she said, "...continue to say five decades of the Rosary every day in honor of Our Lady of the Rosary to obtain the peace of the world and the end of the war, for She alone will be able to help." The Cova, named for Iria, is also the Cova of Peace! Note the slope of the land, which gives us an idea of the shape of the Cova. What appear to be parallel marks in the foreground, could be rivulets of rainwater, running downward . Yet, in spite of the rain, it appears there could be a fire with smoke rising in the upper right. Curious, perhaps it's not raining there as much at the time. Note the speckled appearance of the land in the foreground. Then see the rocks on the ground in a picture below. 70.000 people witnessed the miracle predicted two months in advance by the little seers. Quite a crowd is encompassed in this picture. It appears some of the people are farther away on higher ground. It looks like mist-shrouded trees are rising above them in the far background, perhaps growing on the rim of the natural depression. Note the dark spot with a semi-circle to its right, like a smoky gray. I wonder if the camera actually caught part of the sun and its phenomenon. Note the crowd, like part in shadow and part bathed in light. This is not only a historic picture of the people at a moment in time, but it seems to be capturing a change of light. OCTOBER 13, 1917. THE GREAT MIRACLE. Some pilgrims during the dance of the sun. The photo shows people gazing upward. Note the boy with his hands folded, with a staff under the crook of his arm, perhaps used to guide an animal as they traveled to the site. Note also the stones upon the ground, possibly broken and worn pieces of sedimentary rock, as there's the Dinosaur Footprints Natural Monument at Fatima, and more than 200 prints have been found in a quarry. (Geologically, sedimentary rock deposits in layers or strata and forms a veneer over other rock, mainly of igneous and metamorphic origin. A dinosaur's feet would step in the soft sediment leaving marks of its passage ). On October 13th, during the Miracle of the Sun, it reflected to earth, trees, shrubs, and upturned faces, "all sorts of brilliant colors in succession: green, red, orange, blue, violet, the whole spectrum in fact." One witness of the miracle said, "I saw the people changing colour, they were stained with the colours of the rainbow..."
There also happens to be a Portuguese verb, iriar which means to make iridescent, iridescent literally meaning "displaying the colors of the rainbow." The present tense of this verb iriar, in third person singular, is spelled iria : and means, it, he or she makes iridescent, something to certainly contemplate. It linguistically underscores the miracle. It's as if the sun, with its display of colors, spoke to the people in their own language! The rays of the sun shine on the raindrops, which serve as tiny prisms and mirrors to break up the incoming light into the spectrum of colors. The rainbow is a symbol of pardon and reconciliation given humankind by God, which gives us something to reflect upon. While it's used otherwise today, let us remember the rainbow in light of the way God put it in the sky. We need pardon and reconciliation today! We might even think of it this way: the Light of Christ shines on our teardrops of sorrow and repentance for sin, and produces the beauty of grace.